Both major and niche firearms manufacturing companies choose ISO Finishing because we have developed and perfected specific finishing parameters and recipes to precisely fit each targeted application. We handle projects of any size or complexity along with any number of metal and polymer alloys. 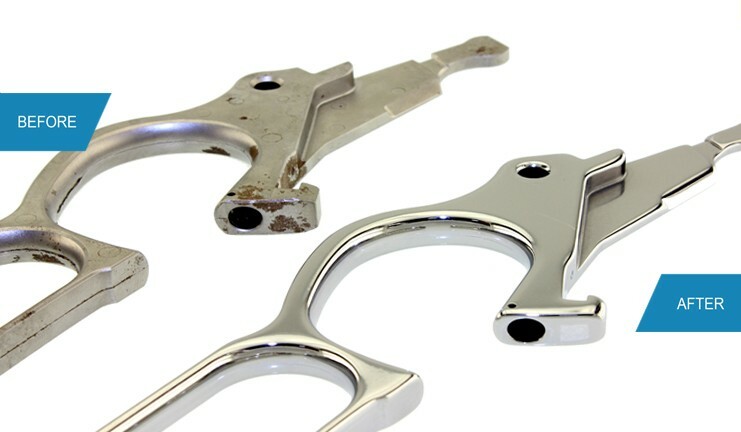 Our facility can efficiently process prototypes to ongoing production runs in the thousands. 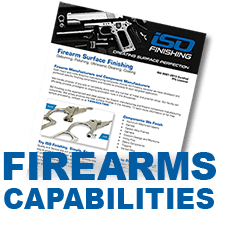 In working as partners with both major and niche firearms manufacturing companies, ISO Finishing has been able to develop and perfect specific finishing methods and recipes to precisely fit each unique, targeted application. Some parts may require heavy deburring with any number of ceramic or stainless steel media and solution mixtures while others may require the final finesse of a specially engineered combinations organic media. Barrel tumblers work well for jobs requiring heavy burr removal. Centrifugal barrel finishing machines are also good for burnishing, rapid radiusing of edges, and heavy deburring. Removing excess material or polishing additive parts, remove burrs, improve surface appearance, polish and clean are all possible using centrifugal barrel finishing equipment. In the manufacturing world, deburring refers various methods used to remove burrs, the residual rough edges or protrusions left behind after a part is produced. Burrs can affect the surface quality of manufactured parts produced where performance, safety, and appearance of a part is concerned. The presence of burrs, parting lines from castings or other surface imperfections affects the adherence, continuity, and general durability of plated materials. Metal surfaces often require polishing and buffing prior to decorative plating. Iso Finishing understands the importance of pre-plate finishing. Polishing is not only used to enhance the appearance of a part, it also helps prevent contamination of instruments, remove oxidation, create a reflective surface, optimizes performance and can prevent corrosion in pipes. When it comes to machined parts, smoother is better for reducing heat and friction. Ultrasonic cleaning is an environmentally friendly alternative to the solvent based cleaners previously used. Ultrasonic cleaning uses high frequency sounds waves, those beyond the range of normal human hearing (18 kHz), and an appropriate cleaning solvent to remove contaminants from parts. The ultrasound can be used with just water or be combined with surfactants to gently remove residual cutting oils and microscopic chips. Since the discovery of gunpowder, people have been designing and building all makes and models of firearms. What started out as a simple means of igniting the powder to propel the projectile through the barrel has evolved into a high precision set of manufactured firearm components. The improved fit and finish has allowed for the increased reliability and performance of today’s precision firearm components and overall finished product. The firearms industry is in a continual flux of change and improvement. Some of the ongoing updates include the incorporation of exotic alloys, new means of manufacturing and the refined functionality of the final assemblies. The surface finish of each individual component or part is integral to the final assembly performance and in meeting these increasingly stringent design specifications. Send a few samples and we will show you a perfect surface finish. There’s nothing to lose and your part finishing will get you noticed. There is no magic here—it’s precision. We customize each finishing process to fit our clients’ needs from start to finish. At the end of the day, we specialize in you. Our centrifugal barrel services are ideal for parts from 3mm³ to up to 9” x 9” x 28” and are custom tailored for each specific component. We formulate a process for each product and provide our clients with finished samples at no charge. Collaboration with the customer is key. If something needs improvement, we’ll use the client feedback to adjust the process—not the standard. The result is a customized, consistent, and repeatable set of specifications for finishing your unique product. We continue to add state-of-the-art machinery, media and inspection equipment to adapt to the industry’s latest advances. Our methods have exceeded expectations by providing a better finishing quality and faster turnaround times than are typically possible in-house or as an outsourced operation. sample processing, contact us at 1-844-623-7998. Copyright © 2014-2019 ISO Finishing Inc. All Rights Reserved.